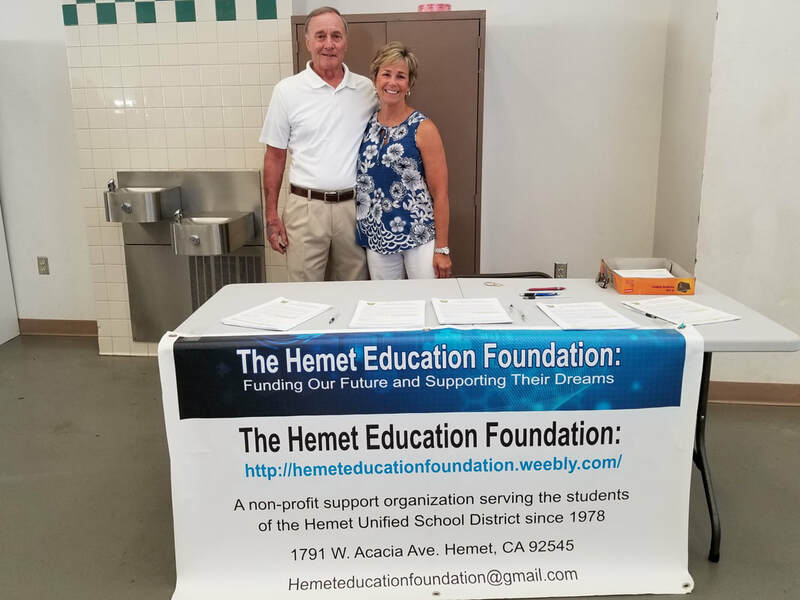 Ron and Sue Breyer, Co-presidents of HEF, distribute "Bucks-a-Month" flyers at the annual HUSD "Kickoff" event. 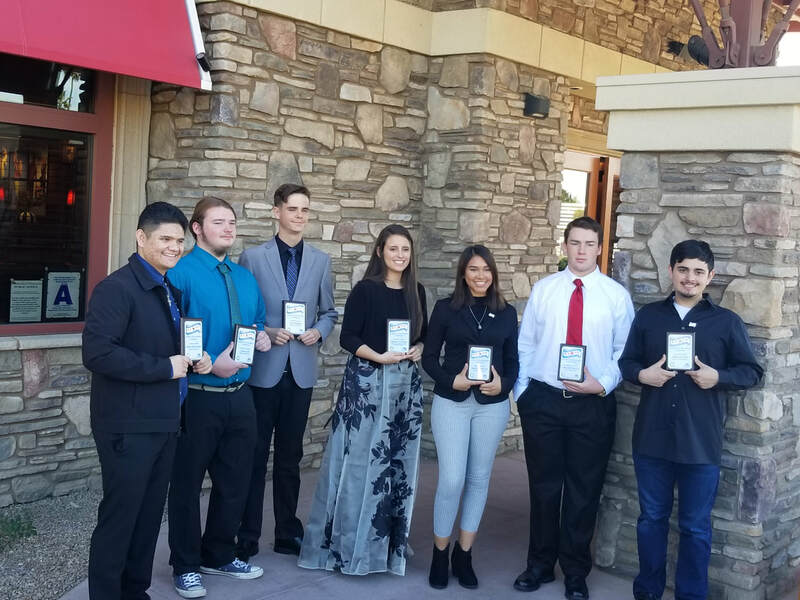 Six Hemet Unified graduating seniors received a scholarship from Hemet Education Foundation to help pay for college.Hemet Education Foundation (HEF) announced six Hemet Unified high school students as its scholarship winners on Monday, May 15, 2017. In order to be eligible for the scholarship, students needed a minimum grade point average (GPA) of 3.0 and a Free Application for Federal Student Aid (FAFSA) score in the intermediate range. These criteria were set to award students who are generally overlooked for funding. Students received a $5,000 scholarship if they attended a comprehensive high school and a $500 scholarship was awarded to students from alternative school sites. Kyle Roberts from ASPIRE Community Day School was selected to receive a HEF $500 scholarship. Kyle will be graduating ASPIRE with a 3.8 GPA and plans on attending Mount San Jacinto College and then transferring to California State University, San Marcos. He said he is interested in the field of computer science and will take courses that focus on digital science and programming languages. He is interested in joining the International Brotherhood of Electrical Workers (IBEW) as a possible career option. Joshua Macedo was selected to receive a HEF $500 scholarship for Helen Hunt Jackson College Prep High School (HHJCPHS). Joshua has attended HHJCPHS since he was in 9th grade. He has maintained a 3.86 GPA throughout his high school career and is excited to see what the next chapter in life will bring him. He will be enrolling in Mount San Jacinto College for two years and then transfer to the University of California, San Diego, to major in biomedical engineering. His passion to help others will surely lead him to become a successful biomedical engineer. Sage Williams was chosen as the Hamilton High School student to receive a HEF $5000 scholarship. Sage will be attending the University of California, Merced to major in Management and Business Economics. Throughout her high school career she has been able to manage her time between academics, community service/volunteer work, and varsity sports. She is excited to begin her life as a college student and pursue her career goals. Caitlyn Toomey was chosen as the Hemet High student to receive a HEF $5000 scholarship. Caitlyn will be graduating high school with a 4.41 GPA and will begin attending the University of California, Los Angeles, in the fall where she will major in the engineering field. Her interests lie in chemical or biomedical engineering, but she wants to keep her options open. During her high school career she was a prosecution attorney for the school’s mock trial team and the President of a local 4-H club. She said she is excited to further her education and gain the knowledge she needs to pursue a career in the engineering field. Zachary Miller from Tahquitz High School was also chosen to receive a HEF $5000 scholarship. Zachary will graduate with a 4.35 GPA, and leave for Connecticut where he will attend Yale University. He plans on majoring in law or politics. Zachary has been the ASB President, Captain of the school’s Water Polo team and Swim team, Academic Decathlon Captain, and a member of the Calculus Club, National Honor Society, California Scholarship Federation, School Site Council, and has volunteered over 200 hours of community service. West Valley High School’s scholarship committee chose Diana Velarde. She will graduate with a 4.30 GPA, making her the 3rd top student in her graduating class. This fall she will be attending the University of California, Berkeley, where she will major in mathematics to pursue a career as a math teacher, engineer, architect, or businesswoman. She has been very involved in her school, participating in clubs like California Scholarship Federation, Link Crew, Fashion Club, Art Club, Mustang Maniacs, and she played tennis. She said her goal has always been to push herself in everything she does so she can make her greatest support, her mom, proud.